The driver famous from winning the Indy 500, Daytona 500 and an F1 world title with his reckless, pedal-to-the-medal style scored his breakthrough victory in Teaneck, New Jersey. Mario Andretti had just turned 22. He was a newly minted member of the United Racing Club, having moved from racing jalopies on dirt tracks in Pennsylvania to more powerful sprint cars, albeit without much success. 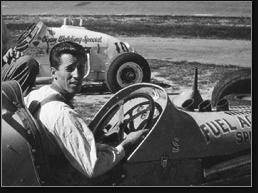 Over the winter of 1961–62, Andretti began driving a 3/4 midget once owned by Bobby Marshman on the rough-and-tumble indoor circuit. It was powered by a Triumph motorcycle engine. On March 3, Andretti entered the 35-mile man event at the Teaneck Armory—future home of the ABA New Jersey Americans. He dueled throughout the race with veteran Len Duncan, a dominant driver on the summer circuit. The two bombed across the finish line together, with Andretti edging him by a tire length. This victory grabbed the attention of team owners and sponsors looking for hot young drivers. In the ensuing month, he won races at Wall Stadium and Pine Brook Stadium. Those wins earned Andretti a ride in the American Racing Drivers Club and, by 1963. he was competing in the United State Auto Club’s national championship series. In1967, Andretti won the Daytona 500 and in 1969 in won the Indy 500. He always said the Teaneck triumph was the breakthrough moment of his career.